The various species of wood we use inside the MOSSpods. 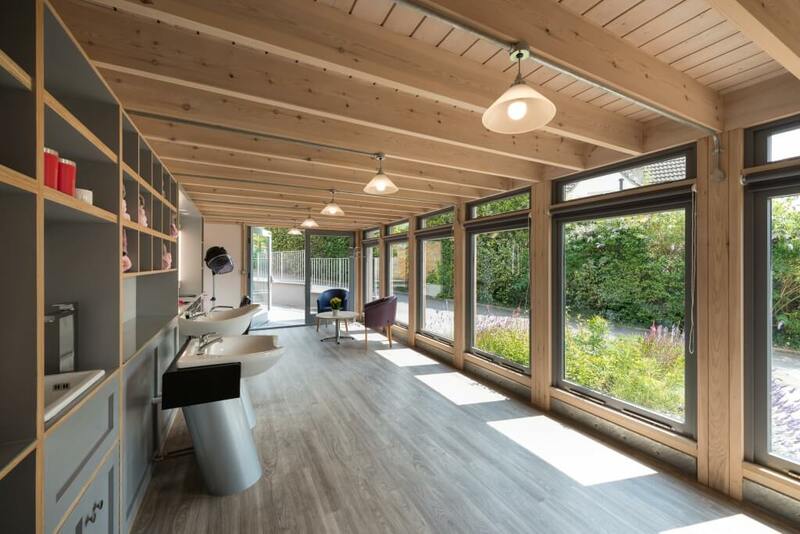 Having discussed the Larch timber used to clad our buildings in a blog a few weeks ago, it’s time to go indoors and tell you about each of the beautiful timbers we have chosen to feature inside our MOSSpods. Our Park Range buildings, in particular, are a celebration of joinery and the texture and warmth of exposed woodwork. Have a look at this range in more detail on the Garden Room Pods page of the website. The effect we have chosen to create is a rich, warm environment oozing with Scandinavian ‘hygge’ and what the Norwegians call ‘hyttekos’ (cabin cosiness). The spaces are far beyond being purely functional and are designed to enrich the environment of the user and celebrate the craft in the making of beautiful joinery. Let’s start with the ceiling of the Park Range MOSSpods. Redwood is one of the most decorative and subtle of the timbers and is lovely to work with. The deep, expressive rafters are crafted from exceptionally stable lengths of Redwood which give a strong, rhythmic quality to the space and are highly resistant to movement. The slight pinky hue of the timber responds very nicely to either a natural wax oiling, that accentuates its rich grain, or a white-wash wood dye that delicately lightens the timber and softens its appearance. Laid on top of the rafters are the same tongue and groove Larch boards used for the exterior cladding. This uniting of interior and exterior finishes is something that we believe is lacking in other buildings. Garden rooms and extensions often look lovely from the outside but can be let down by a boring interior. Birch-faced plywood has vaulted all other materials as the ‘material-of-the-moment’ and it is very easy to see why. 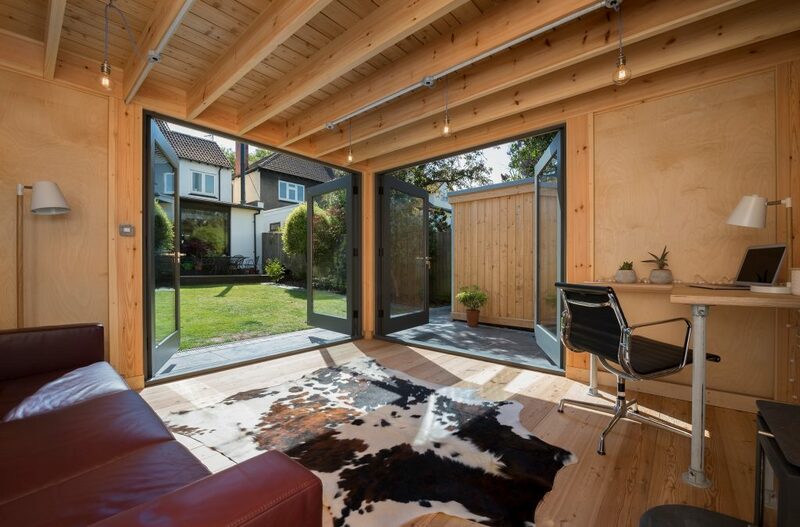 Granted, it’s not the cheapest timber to choose but it absolutely makes a space. Its versatility in use is down to it being beautiful from every angle, including the striated rhythm of the end-grain. Birch is a pale, fine-grained wood that gives a delicate aesthetic that belies its fantastic durability, making it perfect for furniture making. Treated with a natural wax oil, like the redwood rafters, the sweeping curved grain is brought to life and provides a wipe clean finish for everyday wear and tear protection. There are several flooring choices available in our MOSSpods but to finish off the very best pod interiors we lay a stunning Oak floor. With several engineered Oak choices to choose from we have selected a range of very high quality boards that we have tried and tested. Engineered Oak is the most stable wood flooring option for the timber framed building, with several layers of backing ply and a generous 6mm layer of Oak on top. The ‘Character’ grade of the boards showcase the beautiful grain and character of the knots and continue the principles of the MOSSpods as a celebration of natural materials and craftsmanship to stunning effect.